When Cleveland Cavaliers Owner Dan Gilbert welcomed LeBron James' return in 2014, he gave the team's front office a budget that was in his words "a blank check." And he famously added, "they exceeded it!" Gilbert was joking referring to the money the team has spent beyond the league imposed a salary cap, a ceiling on how much a team could spend on salaries so as not to give big market teams with large TV deals or those with fat cat owners willing to go deep in their own pockets an advantage. It was a promise Gilbert made to LeBron and one that he has kept but one that comes with a price in the form of the league's luxury tax. It is a tax imposed on the teams that go over the cap, a tax that gets worse once you've gone over the cap for more than three years in a row. The tax for such repeat offenders ranges from $2.50 to $4.25 for every dollar they spend over the cap starting with the lower amount and moving to the higher depending on how far over the team has gone. Over the last three seasons, the Cavs have paid back to the league around $150 million in luxury taxes, money that essentially is then distributed to the NBA owners who didn't go over the cap. This puts the Cavs in a pickle moving into the 2018-2019 season. ESPN's Brian Windhorst doing the math earlier this year estimated that if LeBron were to return next year and the Cavaliers were to keep the existing roster they would be looking at a luxury tax of $149 million that would almost be equal to their team salary of $159 million which comes to a $308 million total. 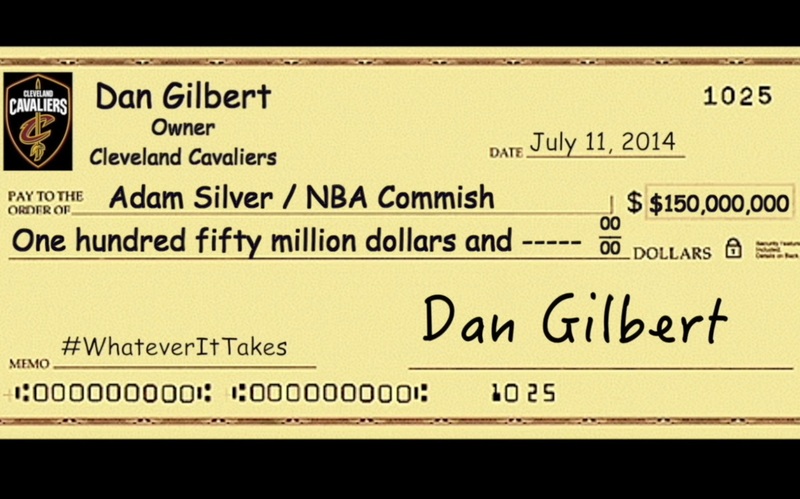 Consider the fact that Dan Gilbert only paid $375 million when he purchased the team from Gordan Gund in 2005. Lest anyone feel the need to take up a collection for Gilbert it should be noted that Forbes Magazine earlier this year estimated the value of the franchise to be slightly higher than that $375 million purchase price. Roughly, a billion dollars more at $1.325 billion.